The traditional Japanese breakfast? Savory, not sweet. Miso soup, steamed rice, nori (seaweed), broiled fish and pickles might not be your ideal breakfast, but the Japanese may be onto something. While we Americans slurp pro-inflammatory bowls of cow’s-milk-drenched O’s or wash a zucchini muffin down with a caffè latte, the Japanese diet tends to lower inflammation and promote longevity. Here’s why. Refined carbs and sugars, saturated fats and allergenic foods so common to the American diet contribute to inflammation. Inflammation is thought to be a major contributing factor in age-related conditions such as arthritis, heart disease, diabetes, cancer and Alzheimer’s. You don’t have to eat sushi before noon. Lowering inflammation starts with increasing vegetables and fruits, whole grains (not flour), nuts and seeds, legumes and healthy omega-3 fatty acids, while swapping out omega-6 fats (including “vegetable oil”—corn, safflower, grapeseed, soy and peanut oils) and sugary, refined eats that rank high on the glycemic index. Here are ten smart, easy swaps. Instead of banana bread or bran muffin, try slices of fresh banana or apple, drizzled with nut butter and cinnamon. Spices such as cinnamon contain antioxidants and phytonutrients that help fight inflammation. Drink tea, especially white or green tea, which contains inflammation-fighting catechins, instead of juices or lattes, which contain high amounts of sugar. 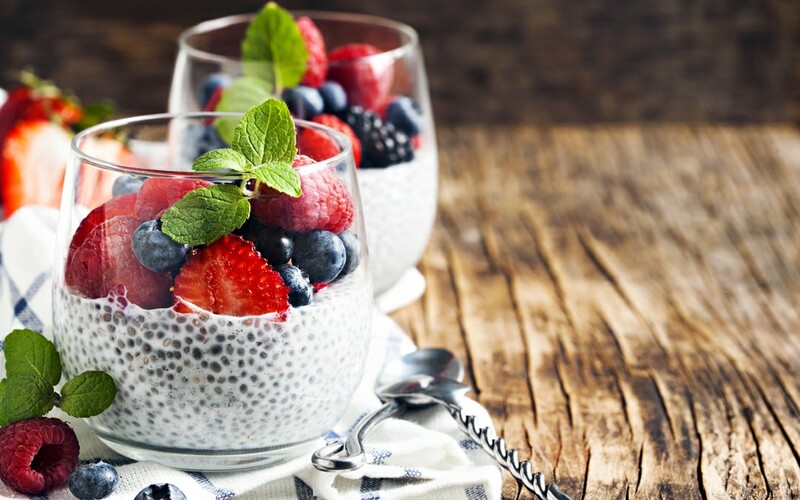 Eat fresh berries on chia pudding instead of sugary yogurt cups. Yogurts contain beneficial bacteria, aka probiotics. However, most store-bought brands come with lots of concentrated, inflammation-inducing sugar. Chia pudding is available at some grocery stores; or learn to make your own with nut milk and chia seeds, soaked overnight. Skip the granola, but don’t skip nuts and seeds. Top fresh fruit with toasted walnuts, ground flaxseed, or hempseeds, which are particularly anti-inflammatory. Replace butter and vegetable-oil buttery spreads with healthier fats, such as extra-virgin olive oil or whole avocado. Enjoy steel-cut oats instead of Special K. Although “whole grain” flours are superior to white flours, a slow-cooked cracked or whole grain digests more slowly and helps keep inflammation in check. Sweeten with cinnamon and nutmeg rather than high-glycemic sugar, brown sugar, agave or honey. Avoid high-fructose corn syrup altogether. There’s a lot of debate about the nutritional differences between refined white sugars and natural sugars, such as honey, but most experts agree that any spike in blood sugar can promote inflammation. Although they contain sugar, whole fruits come with a bevy of fiber and other beneficial compounds that digest more slowly. Instead of an egg-and-cheese sandwich, have an omega-3 egg scramble with chopped vegetables or greens. Or try an organic-tofu scramble. Omega-3-rich eggs help keep the omega-6 ratio down. And whole soy products, such as tofu, offer ample protein along with inflammation-taming phytonutrients. Alternative milk instead of cow’s milk. Sugars and proteins in cow’s milk can contribute to inflammation, particularly of the gut. Try alternative milks, such as almond, hemp or flax. Add greens, not bacon. Leafy greens are powerhouse foods, full of vitamins, minerals and antioxidants. They also contain vitamin E, which helps protect cells from inflammatory molecules. Bacon, on the other hand, provides a high dose of saturated fats. Add spinach, kale, beet greens or collard greens to your scramble or smoothie. Special note: Any food that you have an allergy or sensitivity to (commonly wheat, corn, soy or dairy) can increase inflammation too. You may wish to do an elimination diet for several weeks or order blood tests through your healthcare provider to determine which foods, if any, trigger sensitivity.